Are you interested in seeing what other libraries across the state and even across the US and US territories are doing? 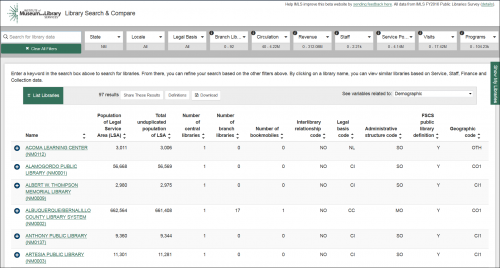 Take a look at the Institute of Museum and Library Services (IMLS) Search & Compare tool. Try it out, and if you have any feedback, use the sending feedback here link at the top of the page to let the IMLS know. Once all feedback is reviewed and necessary edits are made, this tool will be remain available for use by anyone seeking to know more about libraries.